Institution administrators who manage only one institution do not see this page, but immediately the settings for their only institution. When you want to add an institution by clicking the Add button on Administration → Institutions → Institutions, you need to provide some basic information for the new institution. You can change all settings except the Institution name later on. Institution name: This field is required. It is the unique identifier of this institution in the database. It must be one word without numbers and symbols. Institution display name: This field is required. It is the name that all users see throughout the site to identify this institution. Institution expiry date: Tick the Set date checkbox if you want to give this institutuion a specific expiry date. You can then select the year, month and day from the drop-down menus. Institutions do not expire by default. The warning time for institution expiry and the auto-suspend expired institutions options can be found in the institution settings under Administration → Configure site → Site options. 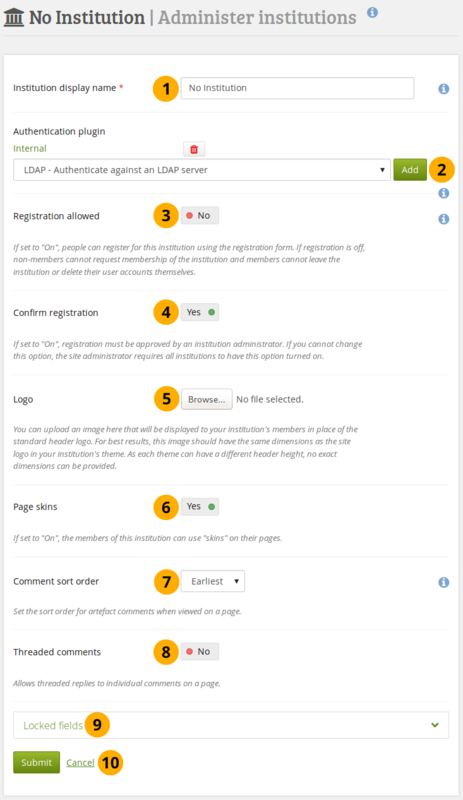 Confirm registration: Switch to “Yes” if you want to control that no new accounts are created unless the administrator approves the registration. You receive a notification about pending registrations when a new user wants to register. Drop-down navigation: Switch to “Yes” if you want your institution to use a drop-down navigation instead of the tabbed navigation. 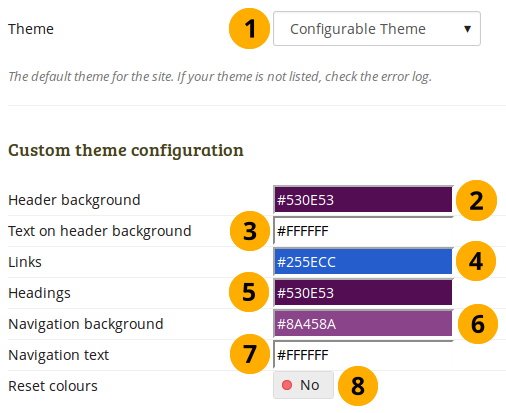 If you use the “Site default” theme option, this option is disabled as the site default settings are applied. 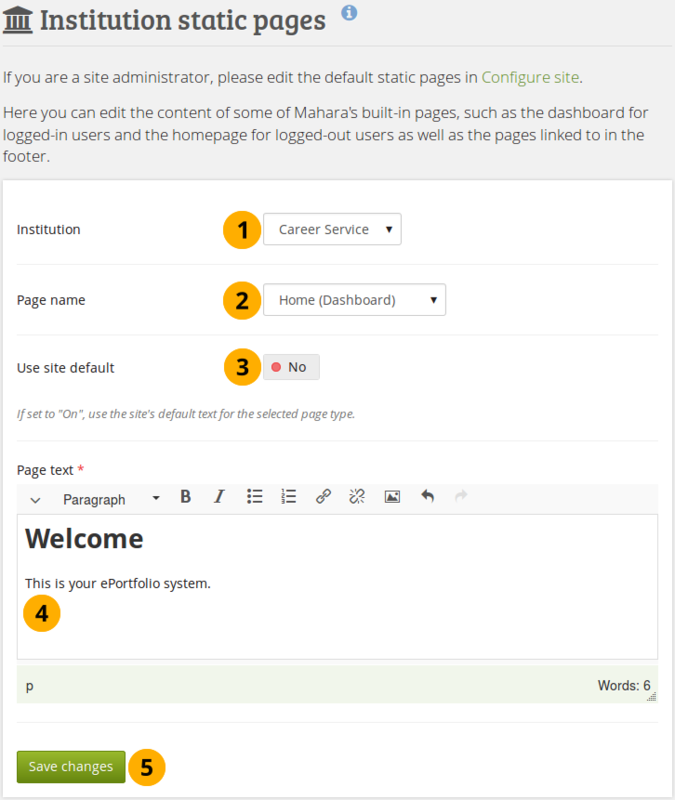 If you wish to use the theme that the site uses, but use a different main navigation option, select the theme directly for your institution, and the switch becomes available to you for selecting. 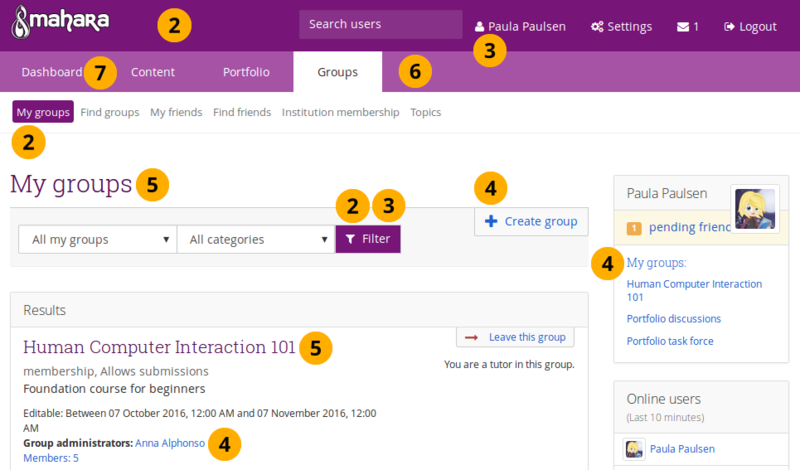 You can upload a logo to any theme replacing the standard logo that comes with the theme. If you upload a file with large dimensions, the logo will be shrunk to fit the available space. To achieve optimal results, upload a small logo. Header background: The colour of the header. Text on header background: The colour of text in the header. Navigation background: The colour of the top navigation bar. Navigation text: The colour of the text / links in the main navigation bar. 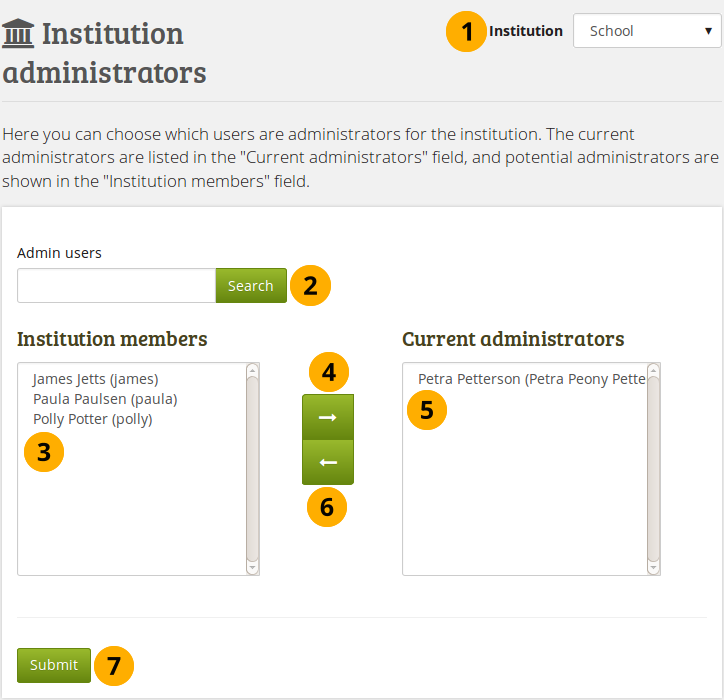 Your Mahara site itself is listed as institution under Administration → Institutions → Institutions. Per default, it has the name “No institution” and you can change certain settings that are applied to the site. 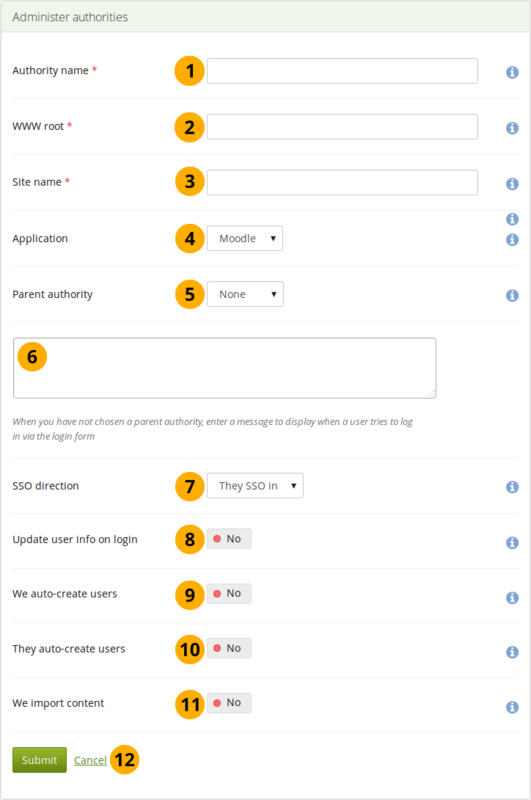 Most settings for the site are made in Administration → Configure site → Site options. Institution display name: This field is required. 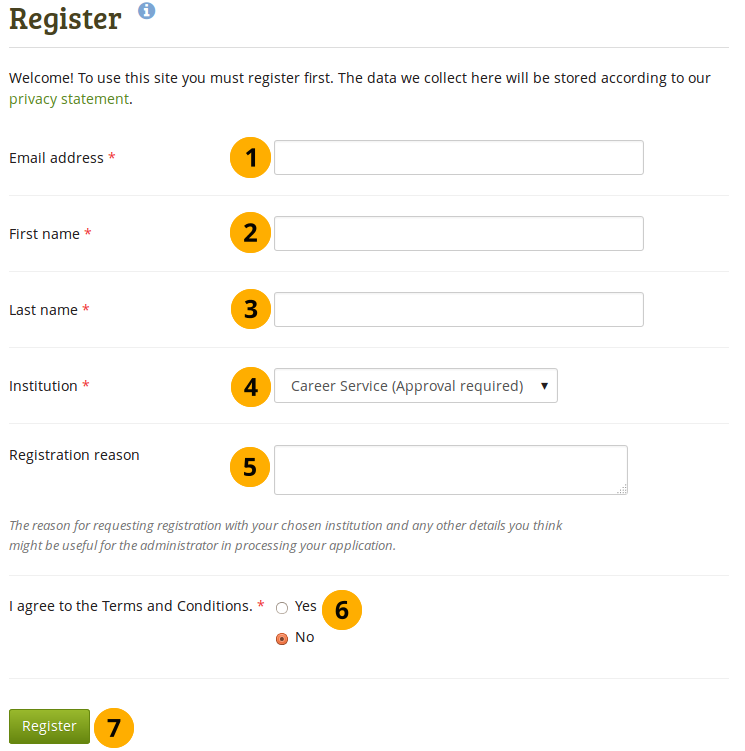 It is the name that people see when registration is allowed for the site without having to register for a particular institution. By default, SAML authentication instances have the “Match username attribute to remote username” setting enabled. 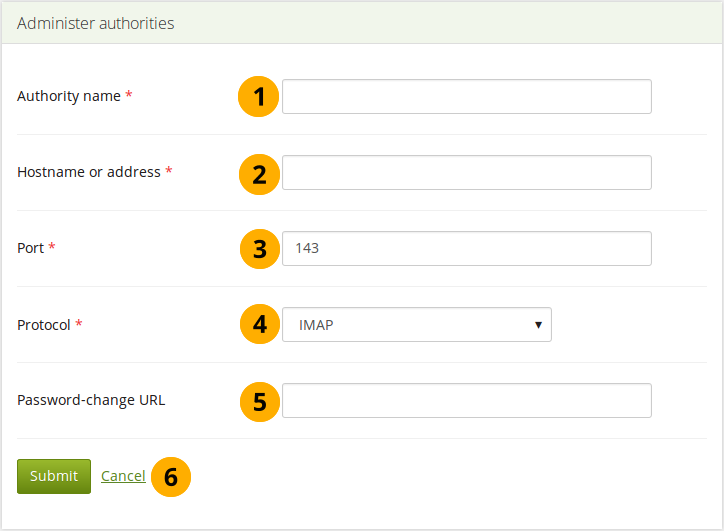 If that setting were disabled, someone with control over any SAML identity provider could gain control over any user account on that Mahara site by setting the username attribute accordingly. In other words, administrators of one institution could control users in other institutions. You would only be able to disable this setting if you set the “usersuniquebyusername” variable to “true” in config.php. However, you should not do that on a Mahara instance to which multiple SAML providers connect and you are not in control of all usernames that are created. 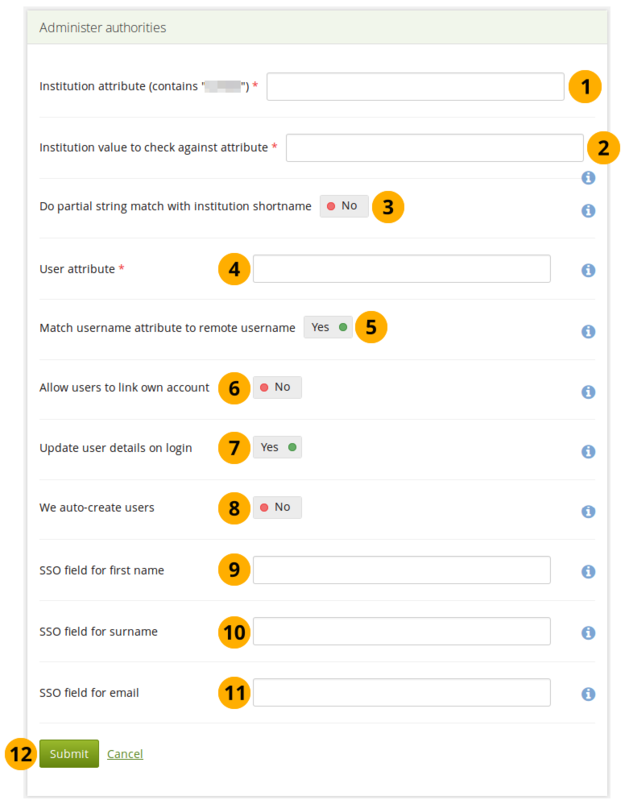 We auto-create users: This is disabled by default and needs to stay disabled if the option “Match username attribute to remote username” is enabled. 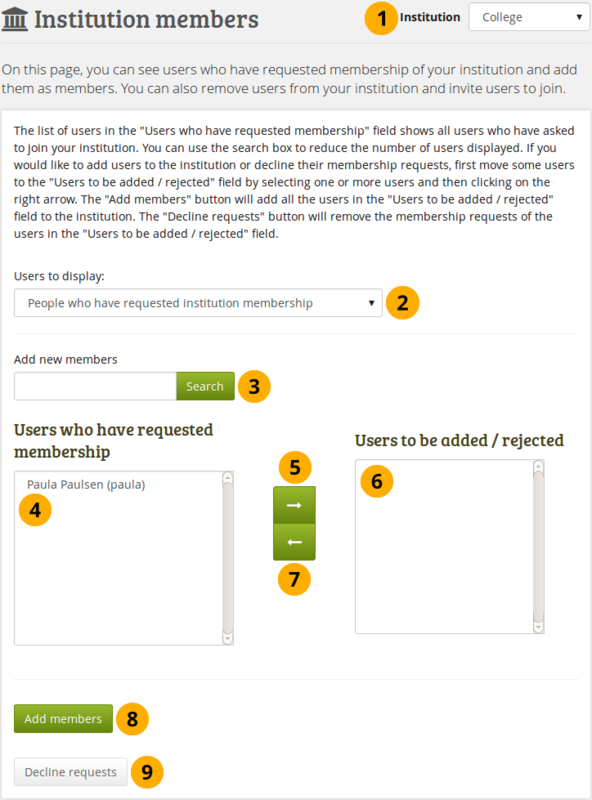 Switch to “Yes” to create user accounts on Mahara automatically when a user authenticates successfully but does not yet have an account. Only if you have the experimental feature of “usersuniquebyusername” turned on can you enable this setting. We do not recommend this unless you are very experienced and have control over all applications in question. WWW root: Enter the web address of the root of the remote application, e.g. http://example.com. This field is required. If your WWW root requires a specific port, enter the port number that the remote application is listening at. You probably will not need to add a port unless you are connecting to a https service or your remote application is running on a non-standard port. Wrong login box message: Enter a message to display when a user tries to log in via Mahara’s login form but is not allowed to if you have not set up a parent authority. They SSO in: Enable this option to allow users from the remote site to roam to your Mahara site without having to enter their username and password. This is the most commonly used setting. The remote application is the source of the login information and where accounts are created initially. We SSO out: Enable this option to allow your users to roam from Mahara to the remote site without having to enter their username and password there. 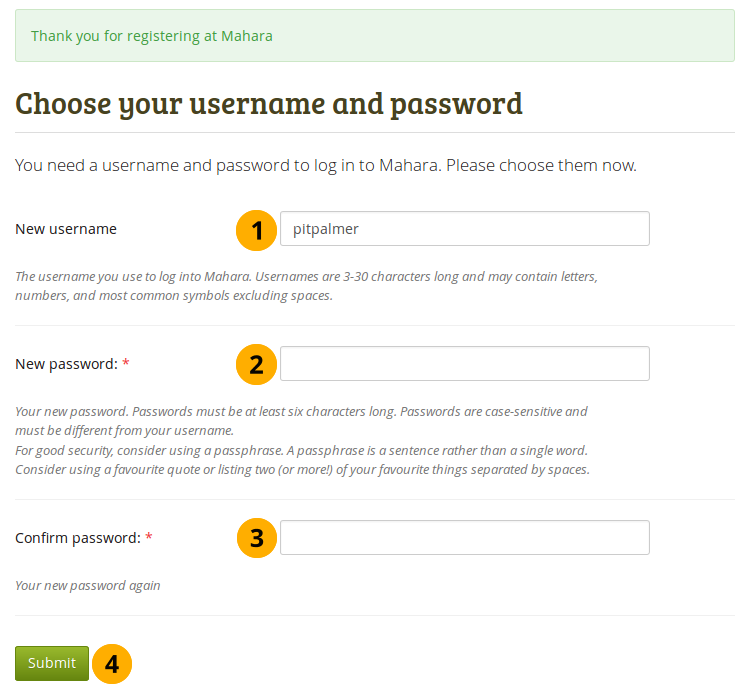 Mahara is the source of the login information and where accounts are created initially. They auto-create users: Only use this setting if you selected “We SSO out” in the SSO direction setting. 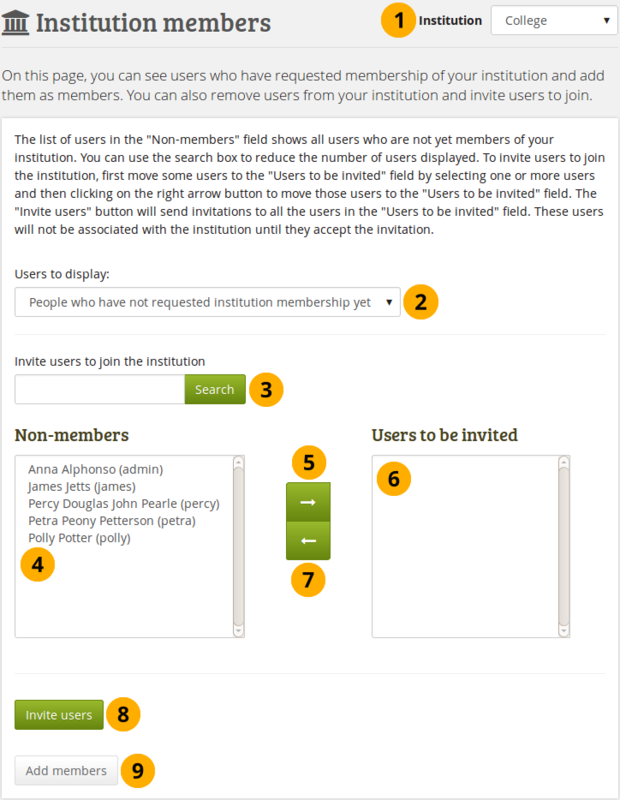 When you have all the members you wish to have as administratorss in the institution, click the Submit button. You can create pages for your entire institution. Although you could always create pages under a regular user account that other users could copy into their own portfolio, the advantage of institution pages is that new members in the institution can receive a copy upon joining the institution. Creating and editing an institution page is very similar to creating and editing a portfolio page. However, not all blocks are available when editing an institution page in the page editor due to the different context. Please refer to the overview of blocks for a list of all the blocks that you can use in an institution page. Click the Copy a page button to start a new page from a copy of an already existing one. This does not have to be an institution page but can be any page that you are allowed to copy. Most feedback: List the pages in descending order based on the number of comments they have received. The page title and description if available are displayed. to update an existing institution pages. to remove an institution pages. You can create collections for your entire institution. Although you could always create collections under a regular user account that other users could copy into their own portfolio, the advantage of institution collections is that new members in the institution can receive a copy upon joining the institution. 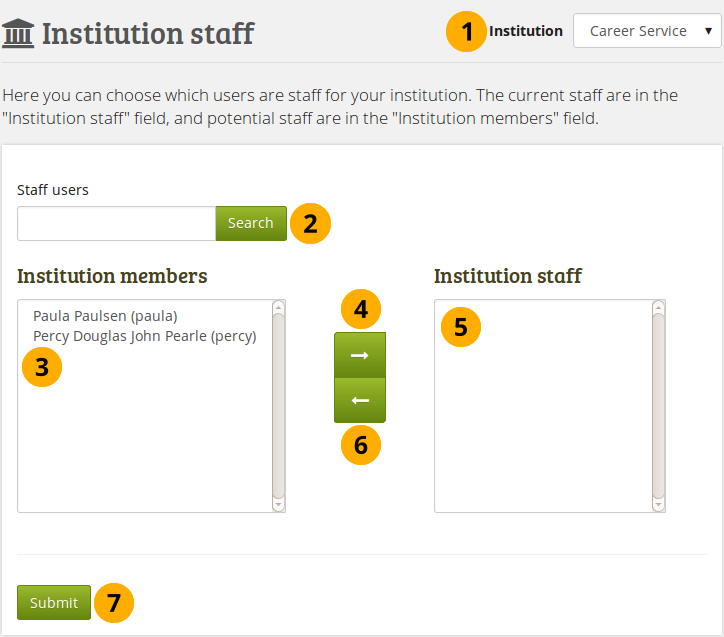 Institution: If you administer more than one institution, select the one for which you want to create or edit collections. If there is only one institution, its name will be displayed without the drop-down menu. Click the New collection button to start a new institution collection. Click the Copy a collection button to start a new collection from a copy of an already existing one. This does not have to be an institution collection but can be any collection that you are allowed to copy. Click on the collection title to go to the first page of the collection. View the description of this collection. Click on any title of a page within a collection to jump directly to it. to move pages within a collection, add to or delete pages from a collection. to change the title and description of a collection. to delete the collection. The pages will still exist. Creating and editing an institution collection is very similar to creating and editing a portfolio collection. All your journals are listed on Administration → Institutions → Journals with their titles. The titles link through to the individual journals. Click the Edit access button to change the permissions of who can view and copy a page or collection. Click the Edit Secret URL button to define a secret URL for a page or collection. When you clicked the Edit access button on the Share page for institution pages and collections, click the Advanced options link and change the switch for Allow copying to “Yes”. 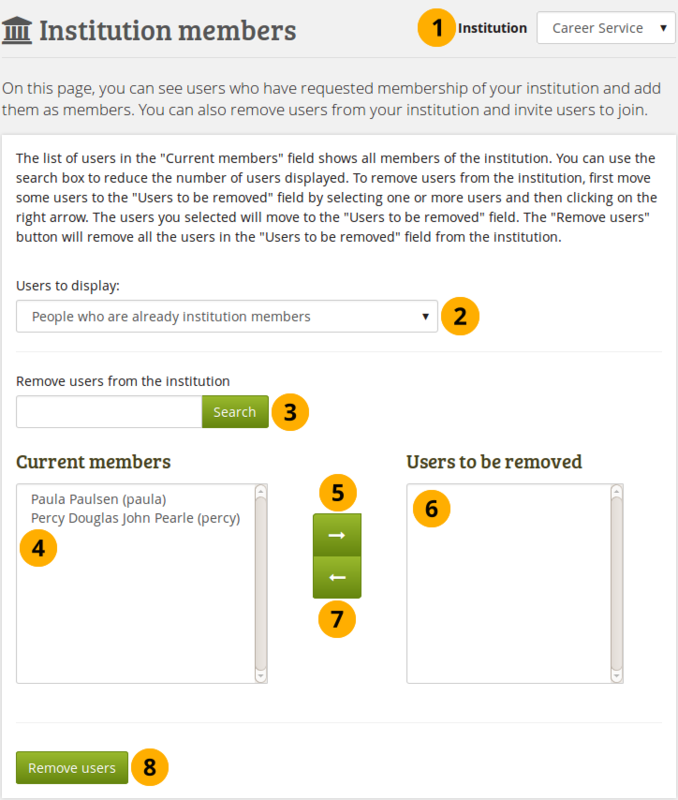 Once you have done that, the switch for Copy for new institution members becomes active, and you can switch it to “Yes” if you wish all new institution members to receive that page or collection automatically upon joining that institution. All institution administrators have access to their institution(s)’ statistics at any time. 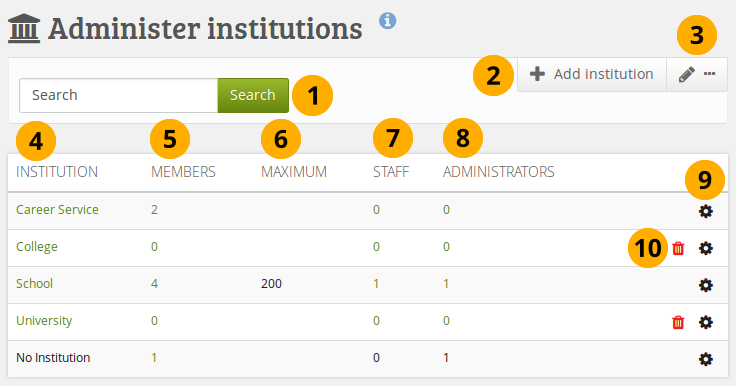 If the site administrator set the staff statistics access correctly, institution staff will also be able to see the statistics for their institution(s). You have access to basic information about individual institutions. Choose the one you would like to see from the institution drop-down menu before proceeding. Growth of your number of users and pages over time in a graph. Institution created: Date when your institution went live. 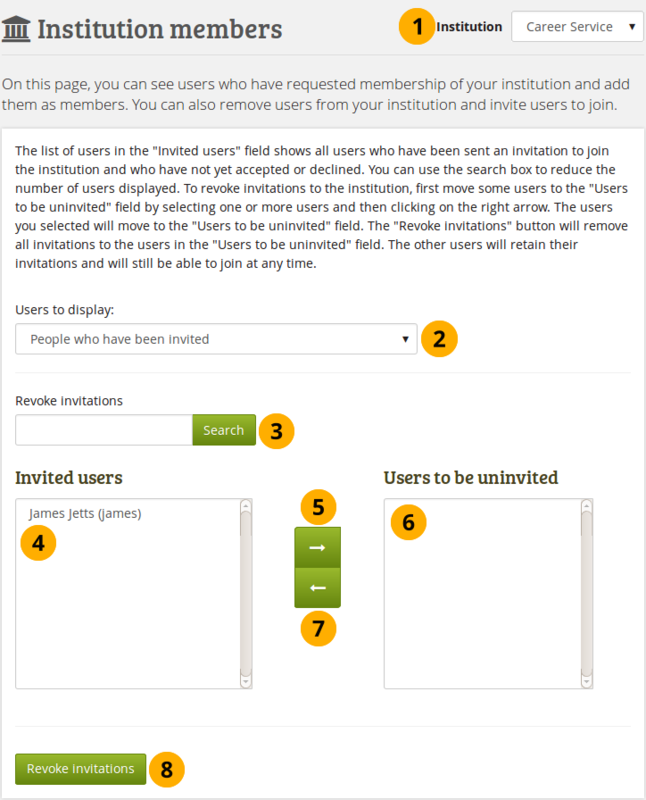 registered users, i.e. everybody who has an account. active users, i.e. users that have at least logged in once and have done something. Disk usage: The amount of disk space your institution uses, i.e. the total amount of space occupied by files. 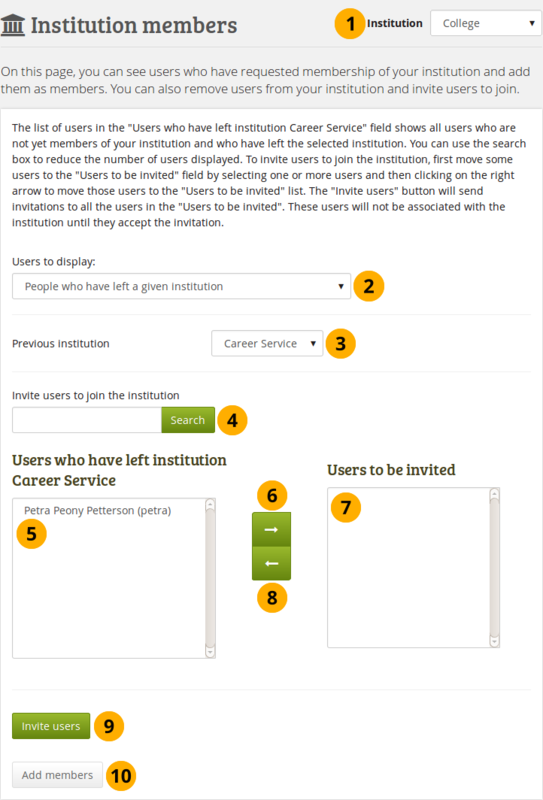 You can see basic information about an institution’s users to keep track of them. Users by type for this institution: A graph showing the distribution of institution members, staff and administrators. 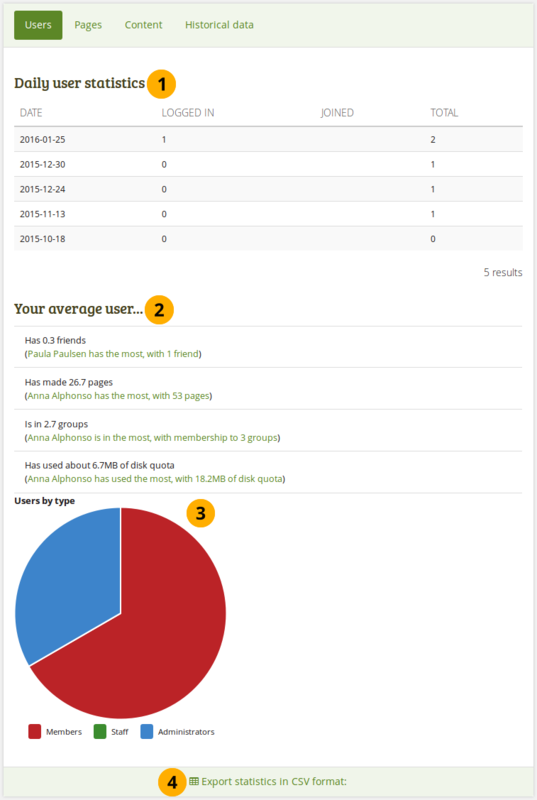 Export statistics in CSV format: Download the daily user statistics as CSV file. 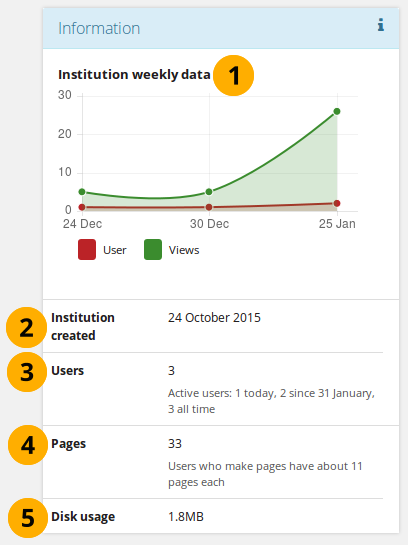 You can view statistics about an institution’s pages in the Pages tab. Most frequently used blocks in portfolio pages: Displays the most frequently used blocks and the number of occurances. 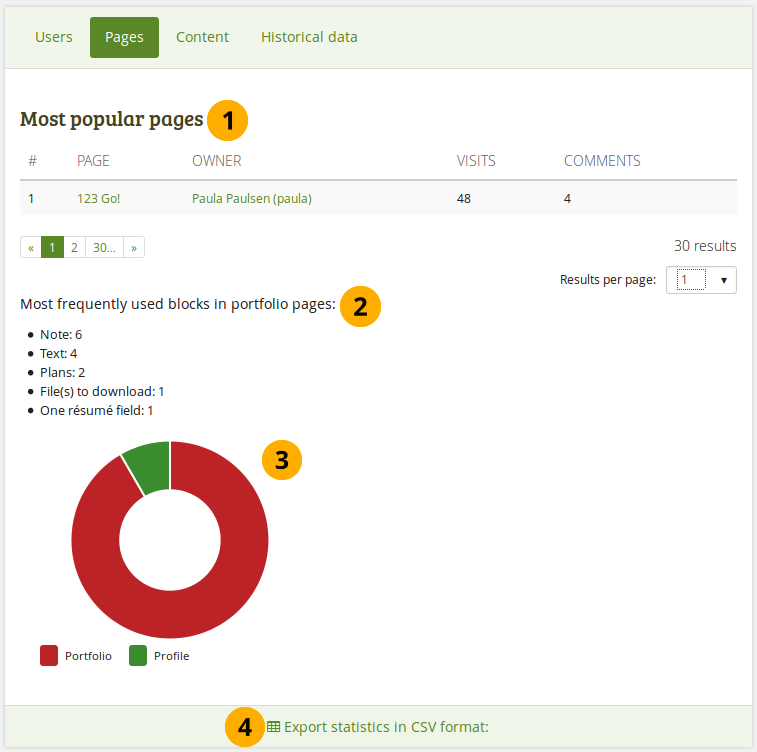 Export statistics in CSV format: Download the cumulative statistics about the pages and number of views as well as comments as CSV file. Name: The statistics item itself, e.g. artefact, block or other general item on institution level. It is linked to the Historial data statistics for an overview of the changes over time. Modified: This column shows the number of updates to an artefact etc. during the current week. Total: This column shows the total number of instances of the statistics items. 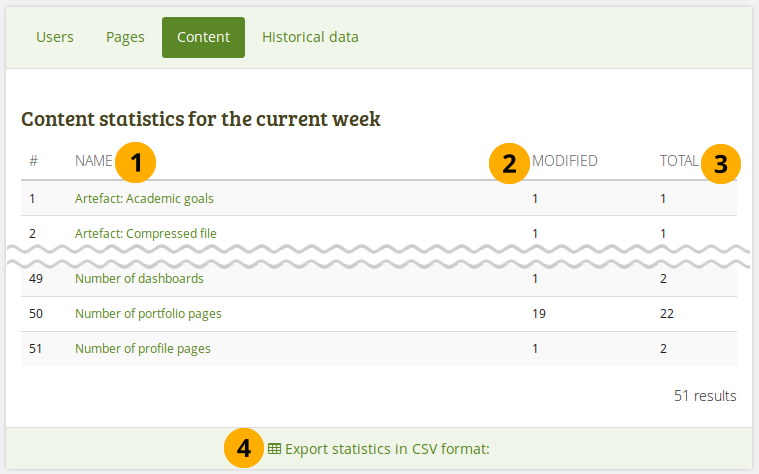 Export statistics in CSV format: Download the cumulative statistics about all the statistics shown for the week as CSV file. The number of total content statistics will vary because only when an artefact or block etc. was used, will the statistics be created for that type. 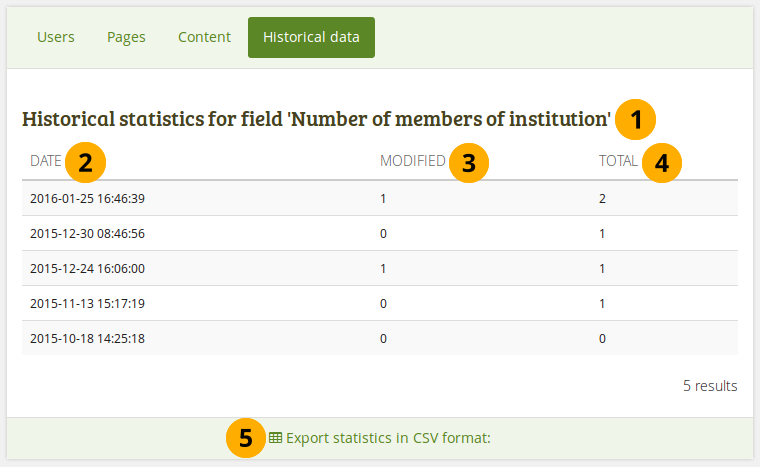 The Historical data tab in the institution statistics holds historical data over time about a particular content item that you have clicked on in the Content tab. 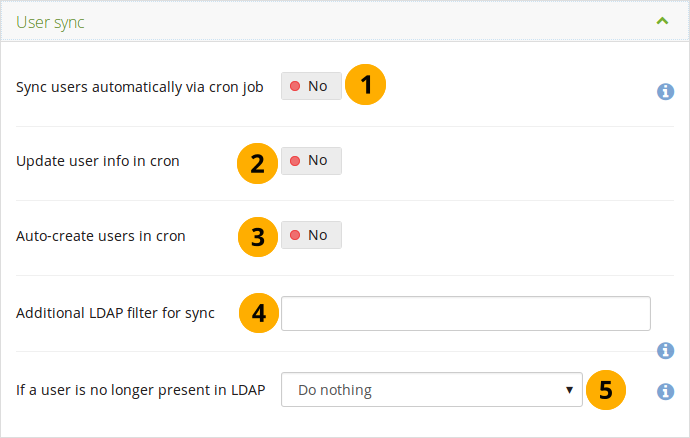 Changes are saved per default on a weekly basis. However, whenever you run the cron manually, a new statistics will be created as well. You can also download the statistics as CSV file. Export statistics in CSV format: Download the cumulative statistics for this particular item as CSV file. When you click on the Historical data tab without choosing an item to look at in particular beforehand, the number of users are displayed as that is a statistics that is available on all sites. As administrator, you can view pending registrations for your institutions on the Pending registrations page in Administration → Institutions → Pending registrations.